Personal Injury Attorney David Wolf firmly believes in giving a voice to injury victims and their families. Over the past 28 years, David Wolf has dedicated himself to the protection and enforcement of the legal rights of accident and injury victims ranging in age from newborns to one client who was over 106 years old. Clearly, insurance companies and big business are always loaded up with attorneys. However, the individual victim does not always have quick and ongoing access to an experienced attorney. Meet Jacksonville personal injury lawyer David Wolf just once and you will seek his dedication to you and your case. With respect to personal injury cases, he had handled them throughout the State of Florida and has co-counseled with attorneys in other States on other personal injury matters. A personal injury can result from a number of accidents or incidents. It is important for the injury victim to get medical care and otherwise be beyond the realm of danger. From there, the injury victim or family member can reach out to David Wolf - days, nights, weekends, and yes, holidays. With David Wolf, you will get an attorney who is On Your Side - At Your Side. With the knowledge and experienced gained throughout his legal career, David Wolf set out to make this information both accessible and affordable to clients, potential clients, and others. As such, beginning in 2010, David Wolf authored his first book and from there authored 10 more for a total current library count of 12 books. The books focus on personal injury, insurance, laws, and safety issues that arise in just about every community on a daily basis. For over a quarter of a century, Personal Injury Attorney David Wolf - has represented residents of and visitors to the State of Florida in car accident cases. From the Florida Keys to the Florida Panhandle and all parts in between, David Wolf has handled cases in most of Florida's 67 counties. While the communities and courthouses vary from community to community, the issues and challenges presented to the car accident injury victim and family remain the same. It is important that a personal injury victim contact an experienced attorney in the aftermath of a car accident to answer questions, provide guidance, and, yes provide legal representation. Every single automobile insurance company that does business in the State of Florida has attorneys in place. You should have your personal injury attorney in the Jacksonville area in place to protect and fight for your legal rights. In Florida and other States, bicyclists - both children and adults alike - are at risk for injuries due to the careless, distracted, and / or negligent driving of motorists. It is important to slow down when a driver sees a bicyclist and respect the legal rights including those related to the use of the roads and streets by cyclists. As required by Section 316.083, Florida Statutes - Overtaking and Passing a Vehicle, a driver of a motor vehicle passing or other taking a bicyclist is required to give the bicyclist at least 3 feet of space. When drivers violate this statute or come close to violating this statute, accidents can and do occur which, in turn, lead to serious personal injuries for the bicyclist. It should also be noted that bicycle injuries and accidents are covered not only by the at-fault driver's automobile insurance policy but can also be covered to some extent by the bicyclist's automobile insurance policy. A personal injury attorney dedicated to serving Jacksonville residents, David Wolf is also the author of the book - Bikes, Trikes and Automobiles - Legal Rights of the Injured Cyclist. When the legal rights of a bicyclist are violated, a claim, case, or personal injury lawsuit can be pursued on behalf of the injured cyclist. Give Bicyclists 3 Feet of Distance When Passing - It is the Law in Florida | Sidewalk Bicycle Riding | Medical Bills for the Injured Bicyclist - Who is Responsible for Payment? Pedestrians are at risk in just about every community. One moment of inattention or carelessness can and does have a devastating impact on the pedestrian and his or her family members. In Florida, pedestrian accidents can occur any time of the day and in any part of the community. School zones and school bus zones, while clearly marked, are often the locations of serious pedestrian accidents causing significant personal injuries to children. While it is common sense to slow down in these areas, we currently live in a world filled with constant distractions from mobile devices, cell phones, and tablets. There are also other distractions in place that have been around for decades include those related to drowsy driving, driving under the impairment of drugs or alcohol, and simple every day acts like eating. If a pedestrian is crossing on a lit crosswalk, the pedestrian should expect that drivers will obey street signs and signals. Even if a pedestrian is not crossing in a designated area, if the driver has the ability to stop or slow down, then the driver also has a duty to do so. Pedestrians have legal rights that can be enforced by a personal injury lawyer in the Jacksonville area when there is an accident or injury. David Wolf is the author of 12 books including the book titled - When the Wheels Stop Spinning - Legal Rights of the Injured Child - What Parent Need to Know After the Accident. 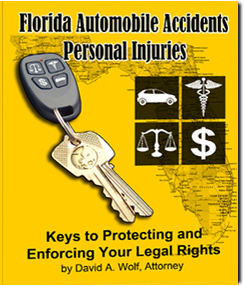 This book has a section that covers topics related to personal injuries in the aftermath of a Pedestrian Accident. Personal Injury Attorney David Wolf - represents adults and children who have been injured as a result of a dog bite or dog attack. In the State of Florida, a dog owner has a duty to follow the applicable leash laws and dog / animal regulations. Furthermore, Florida is a Strict Liability Dog Bite State. As such, a dog owner can be held liable for the personal injuries of a victim regardless of fault or negligent. There are some exceptions to this general rule of law in the State of Florida. Even if a dog had not been vicious or bitten a person in the past, the dog owner can still be held liable. The property owner where the dog resides can also be held liable but only if the property owner was negligent or at fault in some form or manner. For instance, if the dog had a known aggressive personality but the property owner did nothing to require to the dog owner to control or fence the dog, then liability or fault may attach to a dog bite or dog attack case against the property owner that can be brought with the help of a personal injury lawyer in Jacksonville. Unfortunately, far too many homeowner's insurance policies these days do not cover dog bite related attacks OR specifically exclude claims or cases related to dog bite incidents. David Wolf is the author of the book - When A Dog Is Not Man's Best Friend - The Legal Rights of the Dog Bite Victim. A slip and fall case OR a trip and fall case is often referred to as a premises liability case. A property owner (business or residential) has a duty to maintain the premises in a safe and reasonable manner. When there is negligence or fault on the part of the property owner, a slip and fall incident OR a trip and fall incident can take place. It should be noted that a property owner is not automatically liable when a person falls on the property; however, liability can attack if the property owner failed to do something in a timely manner or performed an act in a careless manner. Certainly, a visitor to business or home should reasonably expect the premises to be safe. If there are any dangers on the property - hidden or otherwise, then the property owner should either correct or fix the dangers OR at least warn the invited guest of the dangers. For instance, let's say that there is wet air in the soda aisle at a grocery store. A shopper accidentally crashed the shopping cart into some bottles of soda that were now leaking. The employee of the grocery store was informed of the spill but decided to take his break early rather than put cones down and advise others. The spill remained in place without signs or clean up for 45 minutes. Another shopper then slipped and fell in the soda aisle and fractured her arm. Under these facts, assuming they can be established through evidence and testimony, a premises liability case can be established. The grocery store had notice of a dangerous condition (soda on the floor) and failed to act in a timely manner to clean up the area and / or post warning signs. Keep in mind that slip and fall and trip and fall cases can be quite difficult to prove and premises liability cases are among the more difficult types of cases that are handled by personal injury lawyers in the Jacksonville area. Raised by public school teachers, David Wolf understands the importance of the education and safety of children. Following high school graduation, David Wolf served as a camp counselor for four years. He served as a counselor at a camp run by the Miami-Dade County Parks and Recreation, by a South Florida Montesorri school, and finally at a sleep away camp based in the North Carolina Blue Ridge Mountains. While David Wolf greatly enjoyed his work mentoring and teaching children, he developed a passion for the law and advocacy while enrolled in the University of Florida School of Business. This led to his admission and enrollment in the University of Florida School of Law. From day one of the practice of law, David Wolf has served as an advocate for the protection and enforcement of the legal rights of children. From this baseline of interest, David Wolf has handled hundreds of cases involving injuries to children. The personal injury cases have included a number of different types including those related to the following: automobile - motorcycle, trucking - bicycle - pedestrian - accident, day care center negligence, school negligence, dog bite injuries, trampoline injuries, burn injuries, trip and fall injuries, sports related injuries, transportation related injuries, corporal punishment, child abuse - molestation - and neglect, negligent supervision, and playground injuries. When a child is injured, there are certain rules and procedures to follow. It is important for a personal injury attorney in Jacksonville to understand these rules, procedures, and laws and to act in the best interest of the child. David Wolf is the author of five books that focus on child injury issues including the book titled The ABCs of Child Injury - Legal Rights of the Injured Child - What Every Parent Should Know and the book titled Florida Day Care Center Injuries - Legal Rights of the Injured Child - Building Blocks of Knowledge for Parents. 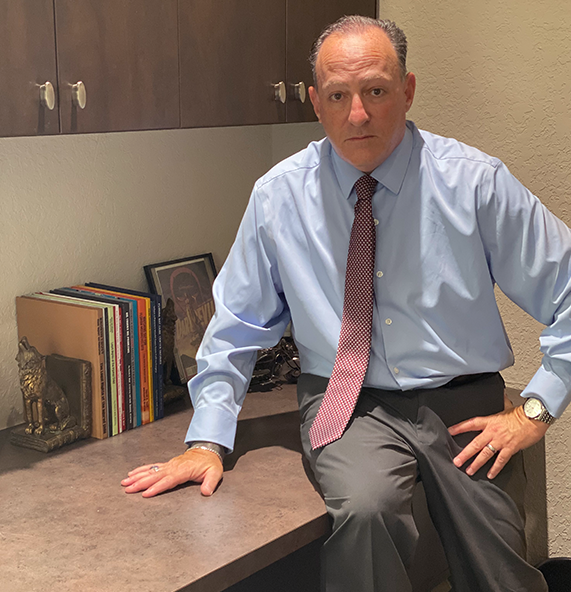 David Wolf is the editor of two prominent blogs - Florida Child Injury Lawyer Blog which focuses on child injury and safety issues in the State of Florida and Child Injury Lawyer Blog which contains articles on child injury and safety issues throughout the nation. There are over 4,000 articles posted to these blogs. David Wolf is a personal injury attorney in the Jacksonville area who combines his skills, work ethic, resources, and life experiences together to promote the interests and protect the rights of his clients. For over 28 years, David Wolf has dedicated his days, nights, and weekends to advocate for his clients who have ranged in age from infants to one client who was over 106 years old. His clients have included children and adults from all walks of life in just about every one of the 67 counties in Florida. He has also co-counseled on a number of cases outside of the State of Florida. The truth is that life is unpredictable. The needs of a client do not always fit neatly in a work day from 9 am to 5 pm. While technology in the form of mobile phones, tablets, and computers are wonderful, they are not good substitutes for legal advice and the presence and hard work of an attorney. It is that direct one-to-one contact with an experienced attorney that can make all the difference in the world to a client. With David Wolf, you will have access, availability, information, knowledge, and, yes, the power of an attorney On Your Side - At Your Side. You can contact Jacksonville personal injury attorney David Wolf - days, nights, weekends, and holidays - through his mobile phone, text messaging, or e-mail. He is just one call away and also there when you need him in person at the office, in court, or wherever else you need him. David Wolf has met with client's in spacious conference rooms stacked with law books. He also has met with clients in community centers, their homes, hospitals, Starbucks, McDonald's, and a number of other locations. You name the place and he will be there. Common Questions About Legal Representation What Kind of Cases are Handled by Personal Injury Attorney David Wolf? During his 28 years of service to clients and community, David Wolf has handled a wide variety of cases including but not limited to automobile accidents, bicycle accidents, pedestrian accidents, trucking accidents, motorcycle accidents, dog bite injuries, day care center injuries, playground injuries, child abuse, child neglect, child exploitation, corporal punishment injuries, school injuries, sports related injuries, amusement and theme part injuries, slip and fall incidents, trip and fall incidents, funeral home negligence, negligent security medical malpractice, nursing home neglect, and boating accidents. David Wolf strongly believes in Giving a Voice to Injury Victims and Their Families. He has done so for his entire legal career as a personal injury lawyer in Jacksonville. While he has a special interest and passion for protecting those most vulnerable to injury - children, his practice and caseload has always included victims of all ages from toddlers to children to teens to adults to seniors. Will I Have to pay for the Initial Consultation? The answer is NO. There is no charge for the initial consultation. All consultation on personal injury cases are free of charge no matter the time of day. A FREE CONSULTATION is available days, nights, weekends, and, even holidays. If you have questions and need advice, David Wolf is there for you. He will be On Your Side - At Your Side. Do I Have a Case to Pursue? This is a common question. You may have a case or claim to pursue but most likely will need to speak to an experienced attorney to find out. David Wolf has over 28 years of experience in the field of personal injury lawyer. You want real answers and real time advice. Give David Wolf a call right now. Are There Time Limits That Apply to Legal Cases and iNsurance Claims? The simple answer to this question is YES. The specific answer will depend on the location, jurisdiction, date of the incident, type of case, and other factors. The deadline to file a lawsuit is often referred to as the statue of limitations. When Should I Consult With a Personal Injury Lawyer in Jacksonville? Generally speaking, the answer is the sooner the better. There are many issues, twists, and turns to even a simple personal injury case. Insurance companies, businesses, and government entities are well equipped and staffed with representatives, adjusters, risk managers, and attorneys. When there is an incident causing injuries, these institutions typically spring right into action and you should as well. Do not wait any longer while others are working and to the some extent scheming against your best interests and legal rights. Contact David Wolf right now. What is my Personal Injury Claim or Case Worth? This is a common and important question for every personal injury client. Each case is evaluated based on the particular facts and circumstances. In evaluating a particular personal injury claim or case, David Wolf will sit down and meet with you to discuss the strengths of the case and, yes, the weaknesses of the case. If you are looking for a personal injury attorney in the Jacksonville area who will only nod his or head and give you only good news, David Wolf may not be the attorney for you. It is important that a client is fairly and honestly informed of the legal rights, recommended course of action, and, yes, the challenges to the case. If businesses, insurance companies, and government entities accepted as "truth" all claims and information provided by an injury victim, then there would be no need for a Personal Injury Attorney to handle a case. The reality is that cases and claims - even ones that seem on the face to be clear cut - are challenged by businesses, insurance companies, and government entities. As such, it is vital to have a Personal Injury Attorney On Your Side - At Your Side for legal representation, advice, and guidance. As to the value of a particular case, it will depend on a variety of factors including the type of incident, date of incident, medical records, medical bills, future medical care needed, permanency and severity of the personal injuries, available liability insurance, and a variety of other factors. With David Wolf, you will get your attorney in place to fight for your rights and who will thoroughly, honestly, and diligently evaluate and pursue your case as your attorney and advocate. David Alan Wolf David Wolf is an "A.V.-Preeminent" rated attorney with over 28 years of experience who handles cases involving personal injury, child injury, automobile accidents, trucking accidents, bicycle accidents, pedestrian accidents, wrongful death, slip and fall injuries, medical malpractice, nursing home neglect, and other personal injury related matters. David Wolf is a member of the Florida Bar, Florida Justice Association, and the Federal Bar - Middle District of Florida.